Below is a list of best San Diego beach for all ages and all tastes. Dreaming of soaking up the sun, relaxing on a picture perfect beach? San Diego offers a fabulous choice of beaches from rocky coastlines with towering cliffs to mile long white sands and crystal clear waters. Join the world famous surfers who ride these waves or just be a spectator. Enjoy a bohemian vibe at a trendy beach or set up for a family camping trip near the water. Twenty minutes north west of San Diego is the most beautiful setting of landscaped parks, white-sand coves and cliffs towering above azure blue waters Ð this is La Jolla, a name that translated from Spanish means "The Jewel". Head to this stunning San Diego Beach and enjoy a walk or a Segway ride along the scenic walking path that skirts the shoreline. Then let the little ones enjoy a dip at the Children's Pool, it is a protected and warm spot where the jetty protects the beach from big waves. 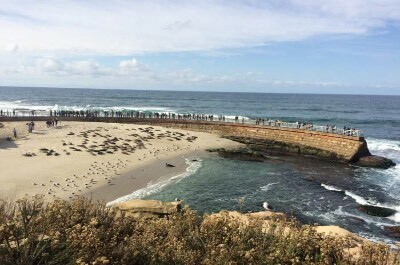 Animal lovers can watch the huge sea lions as they relax on the shore. The beach is clean and the waters are sparkling. Relax on a lounger and soak up the sun or take a dip. If you are a sporty type, try your hand at surfing or enjoy a lesson in stand-up paddleboarding. You can also snorkel and scuba dive to discover the amazing varieties of marine life that live under the water. When you are done, head to the Point La Jolla for a fabulous view over this glorious beach while you sip coffee at the Goldfish Point Cafe. Mission Beach is 15 minutes north west from downtown San Diego. This fun beach side community offers everything from surfing to bathing, skateboarding, cycling, sailing and rowing. 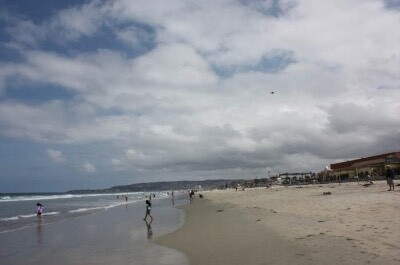 Make a day of it and set off to this glorious San Diego Beach with the family. 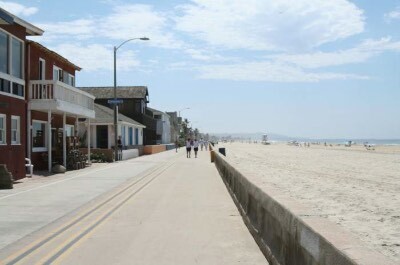 Stroll along the boardwalk that runs along the beach on both the bay side and the ocean side for fabulous views. Enjoy a refreshing swim and then rent a kayak and see the shoreline from the water. If you want to sail in a more relaxed way, there are charter boats that will take you on a guided tour. Watch out for the gray whales that pass here from December to late February and again in the middle of March. After suntanning and enjoying an exotic fruit drink, you can explore the SeaWorld in Mission Bay Park and then head to Belmont Park where the kids will be thrilled to experience the heart stopping Giant Dipper Roller Coaster and other rides like the FlowRider, Vertical Plunge and Tilt-a-Whirl. Looking for a safe and secure San Diego Beach for the children? Head to La Jolla, 20 minutes north of San Diego, and you will find the awesome Children's Pool Beach. This beach offers calm, warm waters that are protected by a seawall, keeping the large Pacific Ocean waves at bay. This secluded beach is also home to seals and sea lions who enjoy the warm waters. The famous Seal Rock Reserve nearby must not be missed. 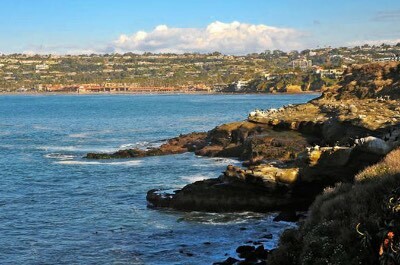 Stroll along the seawall and admire the stunning views of La Jolla and the Pacific Ocean. Then take a dip and relax on the sands. If you want to discover the amazing underwater scenes of colorful marine life, try some snorkeling close to the beach or scuba diving further out at the reef if you are more experienced. The beach has all the facilities you need like bathrooms and showers. If you are a dog lover you can walk your pet in the winter after 4pm and after 6pm during the rest of the year. Everything you ever imagined about the perfect California life in the sun can be found at our next fabulous San Diego beach - Pacific Beach. This small neighborhood is a haven for students, sun worshippers and cool and rad people. Put on your designer bikini or board shorts and join the jet setters. The beach offers miles of clean sand, azure waters and full activities. You can get wet or just choose to relax under an umbrella and soak up the sun. If you are the active type, try some skateboarding or ride a bike ride along the special bicycle paths, then relax and enjoy a plate of fresh fish tacos and a beer at a beer tavern while you chat to like minded people. If you prefer a quieter setting, head to the North Pacific Beach which is ideal for families with children. Nearby is Tourmaline Beach which is a surfing-only beach known for its long low waves that are ideal for beginners to get started on this iconic Californian sport. Another great San Diego Beach for surfing, learning surfing, watching surfing pros in action and all other things surfing, is Windansea Beach. 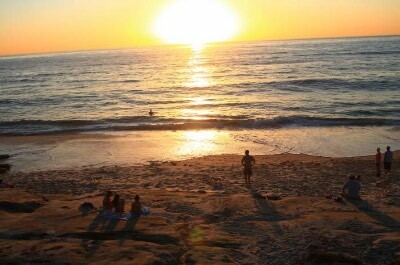 Located at La Jolla, about 20 minutes north of San Diego this beach is all about San Diego's favorite pastime - surfing! The beach does get crowded so be prepared to come early and find your space. The waves are some of the most consistent on the planet due to underwater reefs that help to create near perfect conditions. Set up under your umbrella with a snack and a cool drink and enjoy watching the professionals and the beginners. If you want to swim, you need to be aware that there is a moderate to severe shore break, causing hard breaking surf to crash up to the beach. Swimmers need to exercise caution when entering and leaving the water. There are life guards on duty patrolling the beach. This is the perfect beach for a walk, with rocky outcrops and crashing waves. Windansea Beach also offers the most stunning sunsets, ideal for a romantic picnic date as the day draws to an end. Looking for a fun and bohemian vibe? Set off to Ocean Beach, located between the South Mission Jetty and Pacific Beach Point. This picture-perfect San Diego beach stretches for almost 3 miles offering sun-drenched, white sands, azure blue seas and a trendy holiday mood. The main feature of Ocean Beach is the Pier where you can take a stroll, relax on one of the many benches and watch the waves and the beautiful people go by. This Pier is largest concrete pier on the West Coast and attracts fisherman who come to try their luck. The numerous tackle, bait and angler stores make for a fun shopping experience. 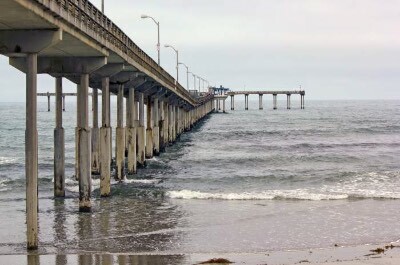 Take your camera and snap shots of the brave surfers as they slalom under the pilings of the Pier. When you are done, stroll through the quaint village and get a tattoo, buy some hand made craft or an antique. There are many restaurants serving up fresh sea food, burgers and beers and you are welcome to come in barefoot. If you enjoy skateboarding, cycling or jogging, join the crowds and get fit. Visit on a Wednesday afternoon and you can buy fabulous fresh produce at the Ocean Beach farmers market. A beautiful picture-postcard beach is our next recommended Dan Diego Beach. 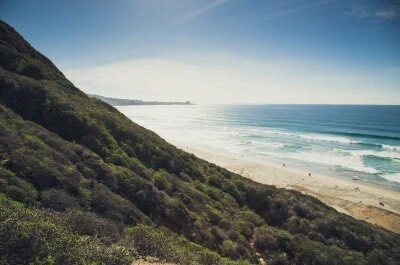 Named after the famous pine trees that grow in this region, Torrey Pines State Beach is located just north of La Jolla. You can make a day of it and visit the beach and the Nature Reserve that borders the beach. Miles of clean white sun drenched sands make this an idyllic spot to relax, enjoy a swim or surf if you are a sportsmen. Near to the beach is a warm and calm lagoon, ideal for children to play in. Make sure you don't miss the hang gliders diving off the massive cliffs that surround this beach. The beach offers clean bathrooms and showers and lifeguards are on duty. When you have had enough sun, visit the nearby Nature Reserve. It is a magnificent coastal wilderness of pine forests, sandstone canyons and hiking trails that take you up to the top of the cliffs for breathtaking views. If you want to play golf, the Torrey Pines Golf Course is one of the most famous in the world. At the far end of Torrey Pines Beach is a San Diego beach that is totally dedicated to nudists. Black's Beach is one of the few nudist beaches in the region and is very well know. If this is your thing, head off north of La Jolla and join like minded people. The beach was named after the Black family who owned horse farms on the lands overlooking the beach before selling off the land to wealthy farmers. Many great mansions still stand on the cliffs that surround the beach and there is a fun funicular leading down from one of the cliff side mansions to the beach. The structure is known by locals as the Mushroom House. Get an all over sun tan as you relax on the sand. The water is fairly rough due to submarine canyon called the Scripps Canyon that causes funnels to swell onto the beach. It is ideal for experienced surfers but swimmers should be cautioned. Watch out for the dare devil hang gliders who launch off the massive rocky cliffs for an adrenaline rush! Access to the beach is along sandy and rocky trails that can be difficult to navigate, so it is not recommended for children or the elderly! 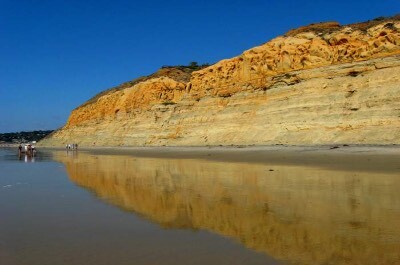 If camping if your thing, our next suggested fabulous San Diego Beach is attached to a famous camping ground. 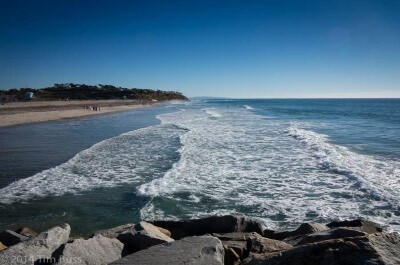 South Carlsbad State Beach is a three mile long beach that is located on the waterfront of Carlsbad. The adjacent camping site has all the modern facilities needed, so you can camp out in a tent or caravan and enjoy this uncrowded beach at the same time. The water is great for surfers who some here to show off their skills. You can also soak up the sun, swim, dive and try your hand at fishing. Parts of the beach are quite rocky, so wear suitable shoes if you intend taking a walk. On weekends, you can take part in a friendly beachball game with locals and tourists. This beach offers fabulous sunset views, perfect for a romantic date. If you are with family, set up your camp and enjoy listening to the sound of the waves as they lull you to sleep. The kids will have a vacation that will create life-time memories. 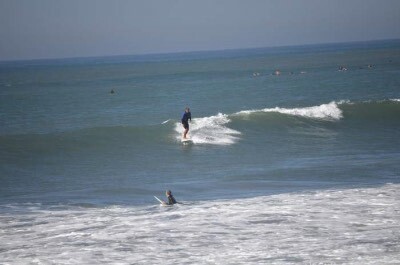 Tourmaline Surfing Park is a San Diego Beach located near to La Jolla, about 20 minutes north of San Diego. It lies at the northern end of Pacific Beach. Tourmaline Surfing Park is known for its famous Memorial to past and present surfers who have ridden these waves. The inspiring words "Surf Well, Spread Aloha, Share Waves Without Judgement" are found on the Memorial. Take a walk around the Park and then head to the sand and sea. The water is clear and blue, the waves are ideal for surfers. Relax, soak up the sun and watch the professionals, then try your skills at kiteboarding or windsurfing. This is more a surfers beach than a swimmers beach. The beach has showers, bathrooms, restrooms and shaded places to sit. Lifeguards are on duty. Stunning views of the towering cliffs and sunsets make for some great photos. Buy a souvenir from the store to take home, a portion of the proceeds go towards conservation and environmental education in the region.